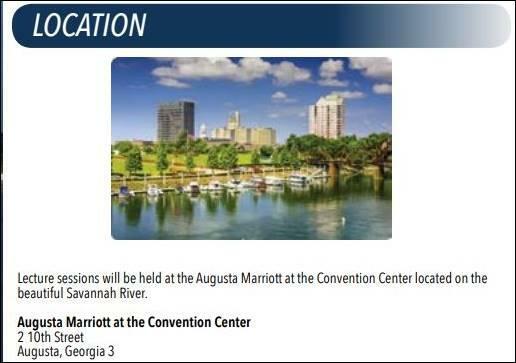 The Southern Conference is very pleased that the 64th meeting of the SCDDE is being hosted by Augusta University School of Dentistry located in Augusta, Georgia. I especially want to welcome the new Dean of the University of Tennessee, Dr. James Ragain who will take the place of Dr. Covington on the SCDDE Board of Directors at this meeting. 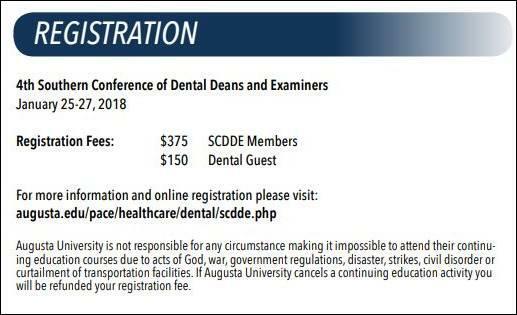 The Southern Conference of Dental Deans and Examiners was founded to provide a forum for discussion of important issues, challenges, and problems shared by the Deans of the Dental schools who lead the process of educating dental students and the members of the state Boards of Dentistry who regulate the profession of Dentistry. Thru this process of regulation and licensure, the state Boards provide an important measure of public protection to insure, as much as possible, that only competent dental practitioners are granted licensure in their state jurisdictions via a process of clinical competency assessments after graduation. To promote and elevate Dentistry, Dental Education, and Licensure in our respective states. It is our goal that continued dialogue will yield an understanding of these objectives as shared by the communities of Dental Education and Dental Licensure and Regulation. Finally, the 65th annual meeting of the SCDDE will be hosted by the UAB School of Dentistry and the Alabama Board of Dentistry. The new Dean at UAB will be Dr. Russell Taichman, who will assume his position this spring. That meeting will be scheduled for January, 2020.